British actor best known for roles in movies like Rambo and The Hobbit (as Dwalin). This photo was from a Convention in 2013, at which I had about 1/3rd of an inch more thicker sneaker than him. Graham himself says "I am 6ft 3in". Funny how they got this guy to play a dwarf when he was 6’2” IRL, I could definitely buy 6’2” peak since he is standing tall in that picture next to you. Looks 6'1-6'1.25 range off the photo (possibly nearer 6'1 flat). Rob, how likely would 6ft1 flat be for now? I'd say it was unlikely he is a flat 6ft 1 if measured, I'd still expect him to clear that mark. Rob, is peak height 6'2.25" possible for him? It's arguable for him in the 90's. I don't think he falls below 187cm even today. Rob, a strong 6ft2 peak and a weak 6ft2 now? I doubt he falls under 187, still noticeably taller than 6ft 1 men in person. I don't get your height chart Rob? You should be over 5'9" in shoes. Editor Rob: any of those charts are just assuming like I am 5ft 8 without shoes. This guy doesn't even Break 6'1" on the height chart, how people are saying he is even 6'2 is beyond me. Impressions aside this guy is not 6'2, nevermind 6'3". Editor Rob: at the event caitriona was at, I saw Graham again up close...minimum 187 range I thought. But then, he had a solid boot, so naturally would have looked taller than the day I first seen him, which he had a fraction less than me. Rob do you ever drop to 172.5 or even less in particular heavy days? Editor Rob: I can still maintain around 173 at my low mark, even after long days out and about or doing work. Extreme dehydration I haven't experienced, so I would say if really ill and dehydrated badly I could creep shy of 5ft 8. I aim to avoid such a scenario though! Editor Rob: I seen him again and he is still a good 6ft 1.5 range I think, no less! 6'2"ers claiming 6'3" isn't that surprising to me. 6ft2 peak is more than fair. He still looks comfortably over 6ft1 today. 6 ft 1 is the most I can give him. Are you stood up at your straightest there Rob? Editor Rob: I think I'm standing resonably from what I remember. I mean there are some back to back I have curved my spine (and belly sticks out) losing height, but not there. You know I think that 6'1.5" is a bit of a stretch, I don't even think he is quite 6'1" to be honest. I think he may wear heels to look his claim at times. At his height I wouldn't lie like he is, 6' 3" is clearly a full two inches above him. He gives a taller impression than Mark Gatiss. Maybe Graham could squeeze out an extra centimetre over Gatiss. Rob, are you sure this guy would still edge out Mark Gatiss? Editor Rob: well there was a fraction more footwear for Mark, and a fraction less for Graham, so there was a noticeable 'swing' in footwear disadvantage for Graham compared to Mark...but I thought they looked similar range. I actually agree with Andrea for once. Beside Rob he clocks in at about 185/186cm. Now he has less shoe so I'm confident he'd hit 187cm solid if measured today. Maybe he's always been a weak 6ft2 Rob? He looked 189-90cm range in Rambo. It's been a long time since i watched PB but yeah... I did think the previous 6'2.5 was possible next to Dom and Wenth, even if i honestly don't remember those scenes that much! With Rob, he surprisingly doesn't look over a solid 6'1! Gave a tall impression on Prison Break .. dont know , he seemed taller than 6'2 , even though he didnt fair off against the other actors more than a 6'2 guy would . 6'0.75, maybe 6'1 in that picture. He's around 6ft1½-2 and about 6ft3 in boots which is what he looked in Rambo IV. 6'1.5 is referred to when you met him or do you think he shrunk the last year? He really doesn't look over 6'1.5 with you but i remember i thought he was a strong 6'2 when he appeared in Prison Break... But again he's only 54, i doubt he lost that much! Editor Rob: I think he's lost a fraction of sorts. Rob, isn't he's giving a shorter impression than Mark Gatiss? Rob, wouldn't that make you 5ft11? 6'1.5 accounting for less footwear cant see 6'2 though unless maybe an inch went missing like with Salmon. I have to agree with you guys. 6'2" really seems like a bit much, and not just based on that photo. I have a feeling he'd measure roughly the same as fellow Brit baldy Mark Strong. 6'1" and no more based on that photo. Not seeing more than a 5" difference. You could argue 6ft1½ for him at the very lowest point of the day but no less. More chance of him being 187-188cm than 186-187cm. In He's maybe ½in shorter than Matthew Marsden who modestly claims 6ft2 but looks 189-190cm. Looks almost 6'2 considering his footwear is 1cm less than Rob's. Yeah I could imagine him making kids to pushups in puddle on the rugby pitch in the middle of winter and forcing people to rugby in a blizzard! This guy looks about as much like a high school PE teacher or football referee as you can get LOL. Actually LOOKS 6'1 range here though. A friend of mine met him at Gardermoen airport in Oslo (of all places) just now and said he'd guess him around 187-188 cm. Wouldn't go over 6'2 or under 6'1.5. It's hard to imagine him being 0.5 inches shorter than Brandon Routh. Why aren't you downgrading him? Obviously not 6'2". You know that. Rob, is it a possible he's near his claim out of bed? He is not 6 ft 2. From the creases in his neck I'd guess he's not standing at his tallest. Subtracting that and his footwear disadvantage I'd say 6'2 is fair enough. im 184 cm/6'0.5 and i look taller than this guy next to my father who is 173 cm/5'8 ..
[Editor Rob: remember I have 1/3rd inch footwear advantage...it bumps him nearer his claim. 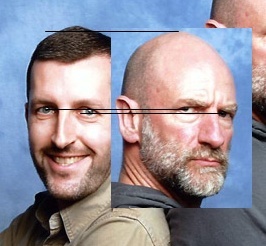 "Graham McTavish's height is 6ft 1.75in (187cm)"
Rob if you say Grahams eye level is not even 5 inches then he is 184cm? do you think he dropped a cm or so? but despite that i still think 6ft 1 is believeale for him. hahaha Sly would love it at 183. And I still think Graham at 187 - 188 cm seems fine even if he gives off an impression of a cm shorter in this photo. He looked pretty tall in Rambo. 6ft 1.75 is way too high for Graham he looks 6ft 1 flat. Graham could fit well at 6'1.75". He seems like a weak 6'2". [Editor Rob: well, actually he did pop by my house. 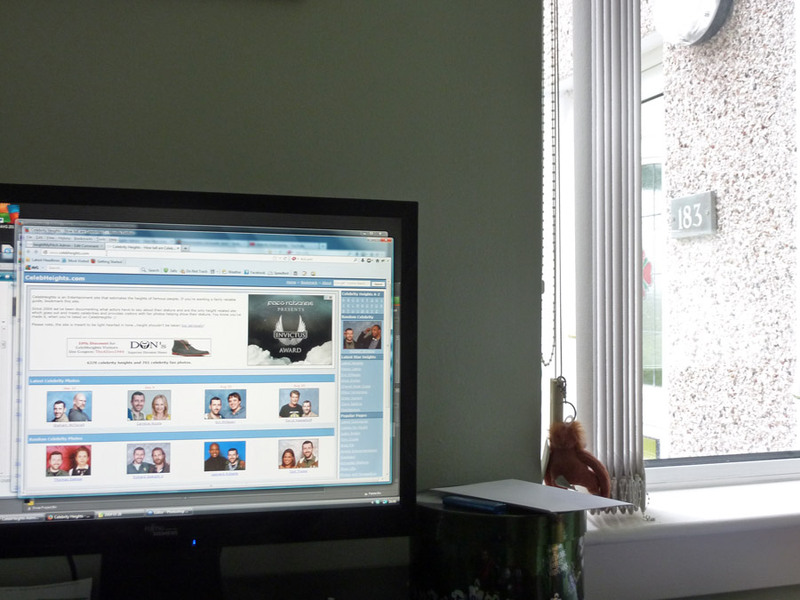 I said to him, Sly, take a seat at my desk and have a look Out of my window....imagine seeing that every day...you'd soon get used to it and think of yourself as 6 foot. I do see a full 6'2" with the footwear disavantage, looks 186-187cm but with .3in less shoes would make him 187-188. For sure looks 6ft1.5-2 max in Rob's pic. But looked 6ft2-3 in Rambo. Same height as Matthew Marsden. Rob, is it possible he's maybe lost a fraction of height? @Ras yeah i just dont see him as a 6ft 2 guy he is still tall though definetly either 185.5cm or 186. @Lo sgozzatore Slys not a midget despite he is only 5ft 9.5 he is quite big and muscular for an average height man. Real short is like 5ft-5ft 4. He doesn't look over 185cm to me. I actually agree with Connor. But believe what you want, however a classic example of a full 6'2 guy is Ben Affleck. Affleck has basically admitted hes 6'1. uhm...after seeing some of his pictures I changed my mind, he could be really closer to 6'2 in truth, maybe his eyelevel looks shorter in this pic because he stands back to back with Rob. With 5'11 James Nesbitt he does look almost 3inches taller, even with the (lifted) Sly he does look a lot taller with normal footwear. Maybe 6'1.5-6'1.75 is closer, I'm not quite convinced about the full 6'2. It's possible given that he's 52 years old that he was a full 6'2 in his prime and is now a fraction under it. Rob if his eyelevel is your height 5ft 8 that would mean he is a 184cm guy just like me, so he might not even be 6ft 1 @Larc 74in actually you could be right larc i think you've got his height well spot on rob is it possible hes only 184cm barefeet if he looked 6ft 1.5-25 with shoes on in person? To be honest i agree with rob he might be 6ft 1.5 and he looks like a mean looking badass i wouldnt say hes 6ft 1 to his face. I posted a pic of myself time ago, I'm 188 flat at worst and just 190 out of bed. Graham looks 6'1 because his eyelevel is 5'8, and he doesn't seem to have a conehead. He doesn't have a low eyelevel, his eyelevel is around 5'8 and his head seems completely average (as I sayed to Connor, he doesn't have a conehead), that's why I'm saying 6'1 and not 6'2. The top of Rob's head is below his eye level and his head is tilted down a bit. And dont forget that 1/3 inch of footwear is 1,5 mm shy of a centimeter. Dear rob with all due respect but you got this totally wrong. He is nothing more than 6'1 or 6'1.25. That was my assumption by looking at picture before opening the page. 6-1" max..not a 6-2" guy stood there. 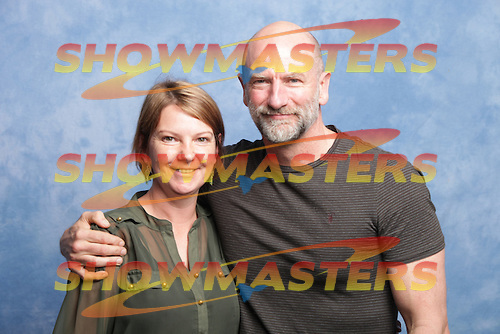 "Graham McTavish's height is 6ft 1 (185cm)"
6-2 peak height ? He doesn't look taller than 6-1 with rob . I see 186cm not a full 188cm though. Rob are you going to downgrade Graham to 6ft 1? [Editor Rob: downgrade a fellow scot, are you mad! ;)...although he very well could be 6ft 1.5. I'm 6'2 and my eyelevel is higher than that. Rob Graham is a strong 6ft 1 i think he is between 186-187cm your eyes are at his chin level. Graham cant be 6ft 2 think about it, robs eyes are around his chin so that makes him a strong 6ft 1 at least 186cm, for him to be 6ft 2 robs eyes should be around his neck so he needs a downgrade i think he is either 186cm or 187cm maybe between. His height looks very similar to height challenger 2. Maybe the 189 was a peak and he is more 188 now, is that possible Rob? Hmm, if he's 6'2" above, it's more likely a weakish 6'2" than strong 6'2". Definitely doesn't look taller than 6'2" in the photo. Why the downgrade? 6'2.5 was fine. In fairness, those are sub-5ft8 guys and 6ft2.5in will look noticeably tall next to anyone below 6ft. But could he be 6ft2in flat? He looks like a tower in that shot.